This week we are looking at the area around Southbank Parklands. What did Brisbane people do for entertainment before television and before movies? Well, live theatre was very popular; and one of the most popular live theatre venues was the Cremorne, built on the river at South Brisbane. It opened in 1911, and here is a photo of it from 1950. One of Brisbane's favourite Cremorne performers was George Wallace, a comedian. He was described as "small and tubby, with goggle eyes, mobile expression and a croaky voice". 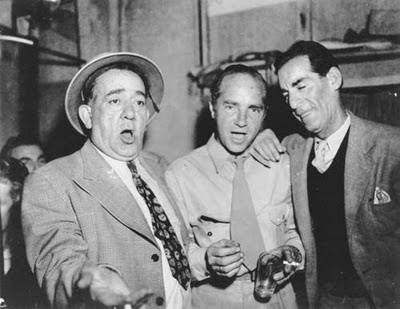 That's George, on the left in the photo above, at a back-stage party at the Cremorne. His son, George Jr, was also an actor and vaudeville performer, and became one of Brisbane's first television "stars" on channel BTQ7. 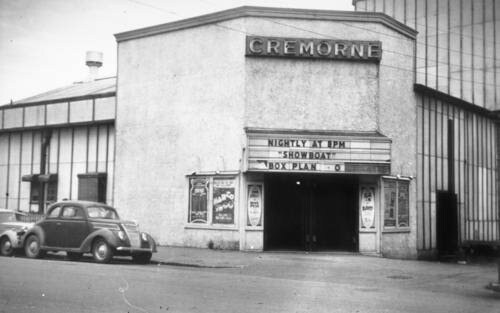 The Cremorne operated until it was destroyed by fire in 1954. After that time, the Theatre Royal in the city became the venue for much of Brisbane's live theatre. In 1974 it was decided to build a new art gallery on the site of the old Cremorne at Southbank, and at the same time to build a Performing Arts Centre as part of the same precinct. This centre, known as QPAC, contains the Lyric Theatre which hosts large live events, and the smaller Cremorne Theatre, named after the original, for more intimate events. A picture of the new Cremorne Theatre can be seen above.